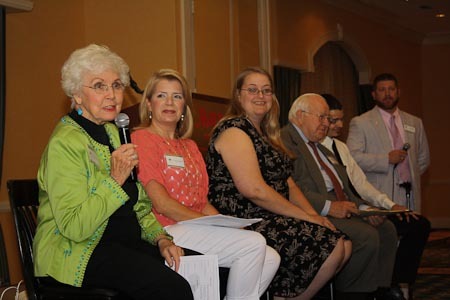 During the June 2012 Luncheon, our panelists were asked to share their Byrnes experience. The panel participants were Lois Anderson, 1949 scholar; Jennifer Palmer, 2004 scholar; April Garrett, 1999 scholar; Bobby Mallard, 1959 scholar and Danny Bananno, 2009 scholar; Jennifer could not attend the event. She sent her responses to the questions and they were read by Carrie Pergerson, 1992 scholar. Ryan Sneed, 1995 scholar, was the moderator. What was your first impression of the Byrnes family either at the interview, your first luncheon, or your first Super Weekend? Judge Mallard: I was in awe of Governor Byrnes when I met him for the first time! My interview was private - just Governor Byrnes and me. He told me from the outset that he didn't think I could finish law school - too much family, a wife with a child on the way. I told him I could do itbecause I wanted to be a lawyermore than anythingand that my wife was going to help me. I guess I won my first case that day because at the end of the interview, he said he believed me and awarded me a scholarship immediately. He also said I couldn't make it on a scholarship alone and insisted that I accept a personal loanof two thousand dollars that he made me promise to keep in the back of my checkbook to only spend in a financial emergency.I still keep two thousand dollars in the back of my checkbook to this day. Jennifer Palmer: After working with Kimberlee Duncan, Mrs. Kenya, and the members of the board during scholarship interviews this year, I was reminded of my first impression of my new family at my interview. I walked into the building and was greeted by Pie. She was so sweet and just exuded this sense of love for the foundation, so immediately I felt at ease. This year, as I watched the potential new scholars walk in and sit in the exact same wingback chair that I did prior to my interview, the feelings and emotions that I sensed kept flooding back. “Why would anyone give a scholarship to me because I have a deceased parent?” “Why are they giving me a free trip to the beach?” and “What has my guidance counselor signed me up for?” As I entered the conference room, I immediately felt like I was walking into Thanksgiving dinner at my Mother’s house and I was waiting on someone to stand up and say grace. I sat down and the first question I remember was “which one or both of your parents are deceased?” I immediately stated “neither one” and while the board members were attempting to pick up their jaws from the table, I continued into my story. After finishing my story and being passed a box of tissues because I had been crying, I looked up to realize that half of the board members were also wiping away tears. In that moment, I realized that I was accepted and became part of the Byrnes family regardless if I was granted the scholarship. Danny Bonanno: My first impression of the Byrnes Foundation was made the day of my interview. I drove from Florence to the Columbia office which gave me plenty of time to think and psych myself out about the task ahead. By the time I walked into the office I was almost certain this would simply waste my time. I was intimidated and confused about the whole situation. At the office Mrs. Kenya did all she could to help me relax, and finally they called me in. The room was filled with professionals from all sorts of fields, each person with a story similar to mine, but that wasn't what I thought at first. I was too busy fearing rejection to open my eyes and see that these individuals had been in the same place as me. After some prodding they convinced me to pour my heart out. I remember leaving the room near tears, but I wasn't the only one crying. After the interview I felt instant relief, even if they hadn't called me with great news, the pressure of bottling up so many emotions had been released. By the end of my first June Luncheon I was even more confused, but by the end of my first year as a scholar, I simply felt that I was part of a huge loving family. April Garrett: Honestly, my first impression was that there was no way I was going to get the scholarship after calling Reverend Norton “Ma’am” during my interview. Then I remember being completely surprised and very honored that these people saw something in me that made them want to invite me to be a part of the family. What character trait has been developed in you as a result of being a Byrnes Scholar and why? Judge Mallard: Character traits that I have tried to develop are hard work, honesty, and commitment because I saw those same traits in Governor Byrnes and I would never want to discredit or embarrass them by not conducting myself accordingly. Jennifer Palmer: Citizenship. Learning about the person that James F. Byrnes was and being part of his living legacy has inspired me to become a better citizen. I have become deeply involved in my community in Savannah and have taken on several volunteer positions. As James F. Byrnes had a passion for politics and making a difference in the lives of people, so do I. I have become involved in the Chatham County Republican Party and carry traits that I have learned from the Byrnes Foundation with me. Mrs. Lois Anderson, the business etiquette skills and the business etiquette book that she gave me on my first Super Weekend have come in extremely handy. I’m currently working on a campaign for the incumbent Chatham County Sheriff and a candidate that is running for District Attorney. Stay tuned, I plan on announcing my run for a local office within the next two years! Danny Bonanno: The Foundation has helped me develop my personality and who I am in a number of ways. Some ways are barely expressed through mere words. I feel as if my character is greatly influenced by the people I associate myself with and the people in my Byrnes Family are amazing in a multitude of ways. One thing that has certainly been brought out in me is my ability to communicate with others. It is crucial in life to communicate well. I feel as if telling a joke cannot be equated to telling the story of a Byrnes Scholar; however it takes valuable skills in order to deliver such a memoiraccurately. Between that and constantly meeting new faces with new stories there isn't much time to be silent. I find I can strike up a conversation with anyone now because I know we must have at least some common ground. In the Byrnes Family, I know exactly what that common ground is. Has someone in your personal life been affected by you being a Byrnes Scholar? Judge Mallard: My wife, Ruthie has been affected. My five children have also taken pride in our relationship with the Byrnes Foundationand family. April Garrett: My entire family has been affected. My very first Byrnes function was the Friday night reception before June Luncheon, where my sister, father, and I met many of the Byrnes members. Many of those Byrnes members continue to ask about my father and keep in touch with him to this day. Then a few years later, my sister met her husband at another Friday night reception. He was a current scholar at the time. They were married two years later. Is there a specific story you’d like to share in which a fellow Byrnes Scholar has blessed you or impacted your life? Jennifer Palmer: Most of you all know Mrs. Carol Ann Green. She is one of the most inspirational people that I have ever met and she gives a genuine meaning to what being a Byrnes Scholar is all about. I was chosen to become a Byrnes Scholar due to the death of my father. Little did I know when I received the scholarship that I would be faced with the death of my mother during my freshman year of college. As anyone else would be, I was devastated and felt as though my entire life was caving in around me. Lucky for me, Mrs. Carol Ann was there to help me learn how to pick up the pieces. She invited me to become part of her young adult panel at A New Road, which is a foundation she started to assist widows in grief recovery. Little did I know that while I was speaking to the widows at this event and had my focus on their recovery, I was grieving the recent loss of my mother as well. This Fall will mark 8 years that I have been a part of her foundation and every year I look forward to returning. I’m not sure that I could ever thank Mrs. Carol Ann enough for helping me develop skills that I had no idea existed. Mrs. Carol Ann, you have assisted a young girl lost in a world of rage and grief, turn into a young woman with self-confidence and the desire to help other people in similar situations. Again, I am ever grateful to you for everything that you have assisted me with. What does the Byrnes Foundation mean to you? April Garrett: It means comfort…security…a passion to help others in need…love…family. Is there a favorite memory of the Byrnes Foundation? Judge Mallard: The many parties at the Byrnes’s homeand Luncheons with Governor and Mrs. Byrnes present are among my favorite memories. Danny Bonanno: I have plenty of great memories from the Byrnes Foundation. I love my classmates and all the time I have been blessed with spending in their company. Some stories are best kept quiet until the proper time to tell them arises. I do distinctly remember my second super weekend. I was excited to go because I knew what the weekend held in store this time and I finally was no longer a freshman. The second night all the scholars stayed up late into the morning. We had even made plans earlier to go to the beach and watch the sunrise. This barely came to be. One by one the scholars began to head to bed or simply pass out in the games room without another word. I decided not to wake anyone and gathered my sleeping bag and made for the beach. I sat there all night, thinking of things that I had tried to put out of mind years ago. In the midst of complicated young adult emotions, reminders of collegeassignments, and the luring inevitability of working next week, I found happiness and consolation in my new-found family-people who cared for me, dozens of them literally a few steps away. And with that thought the sun rose higher, then the rain clouds in front of it, and inside I knew I had found something special and that even the sun must endure the night. What one word would you use to describe the Byrnes family and why? Judge Mallard: Pride…in being a member of our unique family. April Garrett: Commitment: if not for the commitment of Pop and Mom Byrnes, there would not be a scholarship. And if not for the commitment of the scholars who came before me, keeping it going, I would not have had the opportunity to be a part of this family. Now it is my turn to show the new scholars what it means to be a Byrnes scholar and to impact their lives as those before me have impacted mine.